Harney Peak Memories is something you should read. 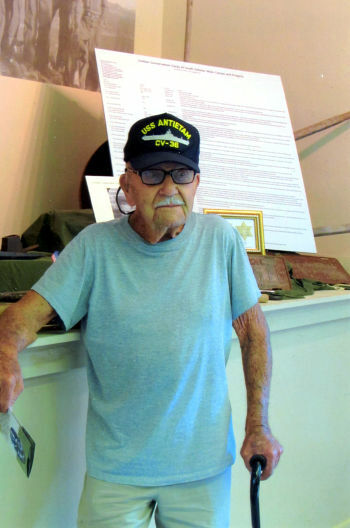 George Roe visited the Civilian Conservation Corps (CCC) Museum in 2012. 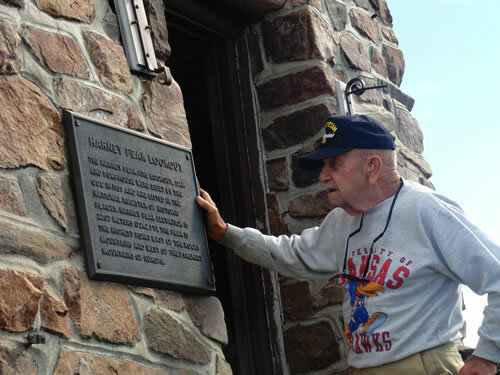 In addition, at 92, Mr. Roe checked off an item on his bucket list when he made the ascent to the top of 7,242 foot Harney Peak that summer. "George Roe from Olathe, Kansas, is a member of the Greatest Generation; one of those ordinary folks who, by the millions from that generation, did extraordinary things during World War II in service to their country," said Rick Hudson, Recreation, Wilderness & Trails Special Uses Program Manager, Black Hills National Forest. 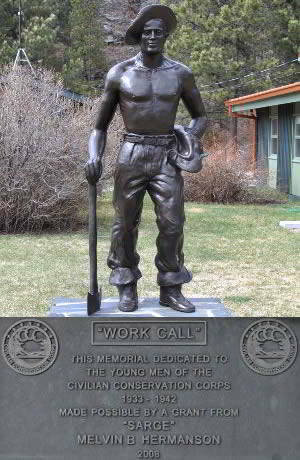 Not only did Roe serve in World War II, during his six year stint in the navy from 1940 to 1946, he was also part of the Civilian Conservation Corps (CCC) crew that built the Harney Peak Fire Tower. "George was one enthusiastic fellow, just raring to go," Hudson said. On the way up, Roe talked about the hike up each day while they were working on the tower and then running back down the mountain at the end of the day. "They would go cross country under the big trees. It was nice and open stands of pine back then," Hudson said. The CCC crew only worked during the summer months and went home during the off season. "Above the mountains of the Black Hills of South Dakota is this massive structure of stone atop the highest elevation above sea level from the from the Rockies to the Alps of Europe-Harney Peak. 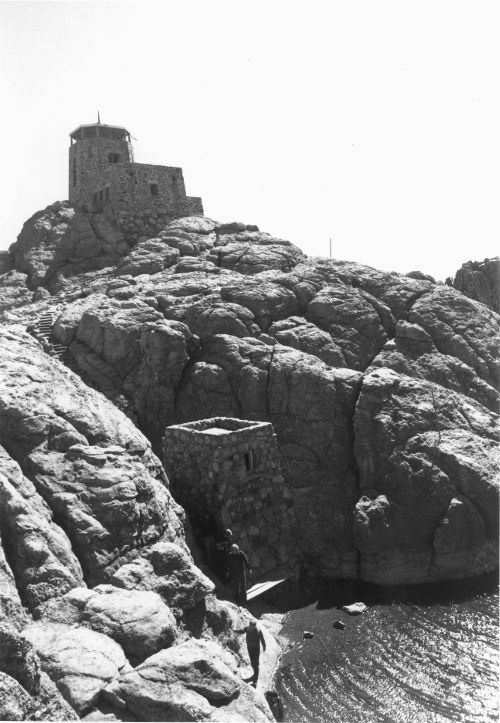 "The old frame building, which once crowned Harney Peak as a lookout tower, served comparably well for its day. But with the coming of the CCC, Harney National Forest officials saw a good chance to make an incomparable improvement. "To quote Neil Hamilton, former project superintendent of Company 791, and under whose direct supervision this was accomplished, 'Quaint sleds were made from discarded grader blades and 3-inch pipe. The trip extends over 3 miles of trail and the boys making the trips were able to make two and a half trips a day. Two horses were used for this purpose. The sleds worked very well as long as there was snow on the ground, but with the inception of summer this part of the work proved to be no more than a horse killer. The sleds have since been replaced with small two-wheeled carts consisting of one half of an oil drum mounted on a short axle. These were pulled by one horse, being fitted with the unfamiliar old buggy shafts fashioned from 1-inch pipe. They proved very satisfactory and nearly anything could be transported to the top in these so-called 'Ben Hur Chariots'. "Perhaps the most difficult problem involved was getting material to the summit of the peak. It is estimated that approximately 7,500 face rocks were needed for the completion of the building. With each "chariot" taking up only 15 to 20 rocks per trip, one can readily realize the number of trips that are necessary. Rock suitable for this building was not available at the building site but was procured in the French Creek drainage below Custer. It is necessary to hand pick the rock from various rock slides and transport them by truck to a stock pile at the foot of the trail. A total of 1,328 sacks of cement was also needed in the building; likewise two carloads of sand. Transportation of these two items is accomplished by pack train. Ten horses were used and trips were made each day with one or the other of these articles. It was possible to haul 2.5 tons of sand to the top daily and the same amount of cement if necessary. "Several thousand feet of lumber were transported by sled, chariot, packing, and by enrollee power. Windows and doors for the lookout tower, lightning arrester materials, plaster, hardware, roofing material, and numerous other items were taken up for the work on top. One of the biggest headaches was the transportation of seven 22-ft logs with a 12inch small-end diameter to the building site. Water, for cement and mortar, was taken from a small dam on top of the peak. This dam was built in 1935 by CCC men and impounds 5,000 gal of water. It is fed by a spring which is very unique in that it is on the very top of the peak where one would despair of ever finding water. "The program for work on the peak included one double shift and one crew working the regular hours. On the way up the trail each man carried a board or some other light article for use in the work. The morale of the men was excellent. They all saw the possibilities of job training to be gained from the project, and their interest and pride in the job was 100%. Actually, the project is the largest and most difficult ever undertaken in the Harney National Forest." Records at Custer State Park indicate that construction on the lookout began April 28, 1938, and was completed in November. The Custer County Chronicle was indicated as being the source of the information. Construction of the tower began in April 1938, and by November the following amounts of material had been used (HPT). 7,000 surface stones; 15,000 hollow tiles; 200 T of sand; 32,800 lb of cement; 500 bricks; 500 pieces--reinforced steel, angle iron, etc; 300 poles, averaging 25 ft in length; 20 kegs of nails; 1,000 ft steel cable; 1,300 lb of steel wire; 800 ft railroad track. All the bottom level floors were built of reinforced concrete. The outer walls are 30 in thick at the base and lined with hollow tiles. The tower roof was topped with sheet copper and grounded by copper cables. The rock used for outer walls and walkways was obtained from French Creek (HPT). George Roe visited the Civilian Conservation Corps (CCC) Museum of South Dakota in 2012. He was part of the Civilian Conservation Corps (CCC) crew that built the Harney Peak Fire Tower.